Coastal Engineering Consultants, Inc. (CEC) provides a wide variety of planning services for private and public sector clients on both large and small scale projects. CEC has developed techniques and strategies to assist our clients in solving complex planning problems, which are backed by a multi-disciplinary team of planners, engineers, scientists, surveyors. No job is too large or small for the staff at CEC. Our goal is to provide the highest quality service to our clients with personal attention and commitment to the timely and cost effective completion of projects. 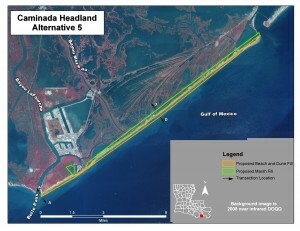 Among other notable projects, CEC has performed planning and engineering design services that supported the successful completion of Feasibility Studies for the Barataria Basin (Caminada Headland) and Terrebonne Basin Barrier Shoreline Restoration Projects. The work on these feasibility studies, in support of the USACE New Orleans District and the Coastal Protection and Restoration Authority of Louisiana, included full participation in the USACE Six Step Planning Process in which we utilized our in-depth knowledge of the USACE Planning Guidance Notebook, Engineer Regulation 11052-100. In other instances, CEC staff have participated as experts on Independent External Peer Review Panels reviewing projects including: water resources, port expansions, feasibility studies, and shoreline protection, among others. For more information, please contact Michael Poff, 239-643-2324, Ext. 126, mpoff@cecifl.com.